Talk about green tea!! Young hosts can serve up a pot of tea while doing something really good for the earth. 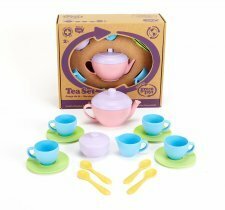 Like all Green Toys® products, our Tea Set is made from eco-friendly materials, helping to reduce fossil fuel use and CO2 emissions, all in the name of Good Green Fun™! Meets FDA specs for food contact. Dishwasher safe. 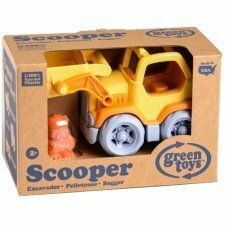 Green Toys™ Blocks are the world’s most environmentally friendly basic building set. All 18 boldly colored blocks are oversized and lightweight, making it super easy for tiny hands to stack and unstack. 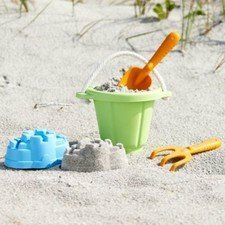 This unique block set includes a variety of shapes for building castles, towers, or any imaginative structure budding architects can dream up. Most importantly, Green Toys Blocks are safe. 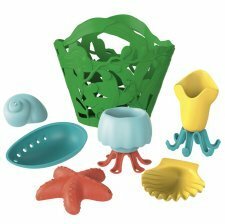 Made from 100% recycled plastic milk containers. 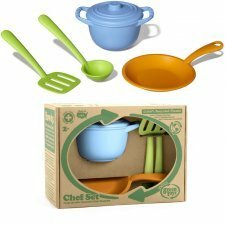 No BPA, phthalates, PVC or external coatings, and also meets FDA food contact standards. Packaged with recycled and recyclable materials and printed with soy inks. Perform at the big top, roll in the mud or explore around the pond. 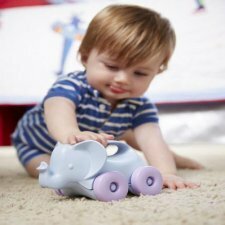 Open play is the name of the game with the Green Toys® Animals-on-Wheels fun, friendly-faced push toys for babies and toddlers. Made in the USA from 100% recycled plastic milk jugs that save energy and reduce greenhouse gas emission. 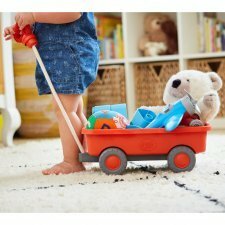 They are easy-to-grasp handle and free-spinning wheels that encourage both fine and gross motor skill development. 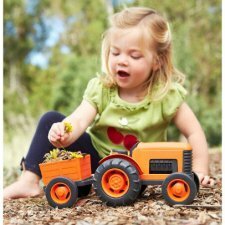 The compact, rounded bodies are designed with no sharp edges or metal axles, making these rollers perfect for encouraging imaginative, eco-friendly play for early crawlers. Recommended for ages +6 months. 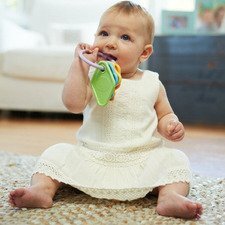 Shake, rattle and explore with the My First Green Toys® Twist Teether. 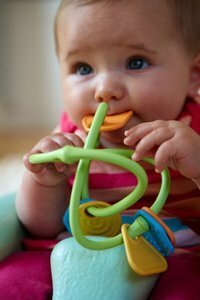 Tiny hands can easily grasp this lightweight, three dimensional, ultra-safe teether. Each uniquely shaped and colorful charm has a distinct texture to stimulate visual and tactile senses. Made in the USA from 100% food-safe recycled plastic milk containers that save energy and reduce greenhouse gas emissions. No BPA, PVC, phthalates, or external coatings. Meets FDA food contact standards. Dishwasher safe too. Color combinations may vary. 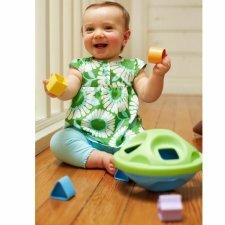 The Green Toys™ Stacker takes a classic toy and makes it safer and more playful. 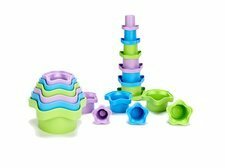 The eight whimsically colored nesting pieces stack easily from large to small, while also allowing little builders to use their imagination and stack in any order. 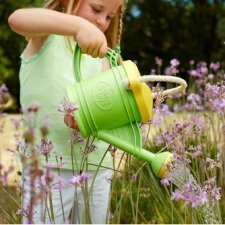 Little ones can develop hand-eye coordination and color recognition while having plenty of Good Green Fun™. Most importantly, the Green Toys Stacker is safe. Its unique design has no center post. 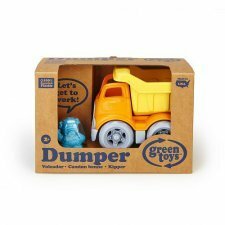 Made from 100% recycled plastic milk containers. 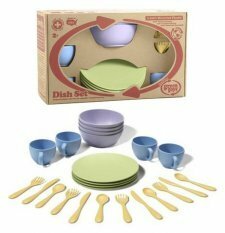 No BPA, phthalates, PVC or external coatings, and also meets FDA food contact standards. Packaged with recycled and recyclable materials and printed with soy inks. 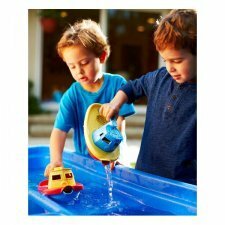 Colours: yellow scooper or orange scooper.